Over 200 terabytes of the government web archived! In our December post, “Preserving U.S. Government Websites and Data as the Obama Term Ends,” we described our participation in the End of Term Web Archive project to preserve federal government websites and data at times of administration changes. We wanted to give a quick update on the project — we have archived a heck of a lot of data! Every web page we have archived is accessible through the Wayback Machine and we are working to add the 2016 harvest to the main End of Term portal soon. 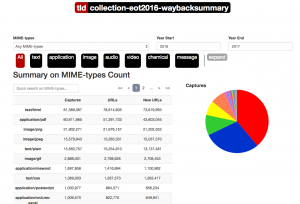 While we continue to analyze this collection, we posted some preliminary statistics using the new Wayback Machine’s summary interface for this specific collection, which can be found on the End of Term (EOT 2016) summary stats page; those and additional stats are served via a public EOT 2016 stats API and the full collection is also available. Through the EOT project’s public nomination form and through our collaboration with the DataRefuge, Environmental Data and Governance Initiative (EDGI), and other efforts, over 100,000 webpages or government datasets were nominated by citizens and preservationists for archiving. The EOT and community efforts have also garnered notable press (see our End of Term 2016 Press collection). We are working with partners to provide access to the full dataset for use in data mining and computational analysis and hosted a hackathon earlier this year to support use of the Obama White House Social Media datasets. While the specific End of Term collection has closed, we continue our large-scale, dedicated efforts to preserve the government web. Working with the University of North Texas, we launched the Government Web & Data Archive nomination form so the public can continue to nominate public government websites and data to be archived.